On 14th March we were joined Trevor and Christine Porter from the Salvation Army. Trevor is the volunteer coordinator of a team of 35 drivers and chaperones working in the East Midlands, moving trafficked people to safe houses. He and Christine also work together as driver and chaperone as part of the team. Trevor talked about the national contract which the salvation army provide to support victims of human trafficking and modern slavery. We heard how this is consistent with the original work of the Salvation Army, right back to the early days of trying to help “women of the streets” – they have always been able to provide places of safety to those in need. We spoke about how the victims are coerced into doing things they have not agreed to, with very little pay and often threats of or actual violence. Victims could be involved in working in car-washes, nail bars, working on the land, in prostitution or in domestic service. Trevor and Christine received text messages from their Head Office when help is required and either they or a member of the team responds to collect someone from a place of danger (often in the South) and take them to a place of safety (often in the North), or to pass them on to another driver to take them further. 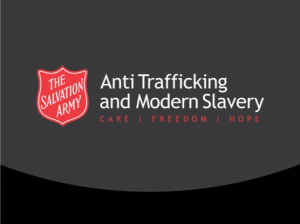 The Salvation Army also provides first responders, victim support and a network of safe houses. We talked about how to identify potential victims, and Trevor told us about the Smart Phone application “Unseen” which could help if we are worried about a situation and want to report something. The talk uncovered some difficult issues, as when a victim is found to be in the country illegally (even if brought here without consent), the Home Office will seek to deport them. We talked about how returning to their country of origin might be worse than being here under modern slavery conditions for the person involved. The session was well attended, and we collected £40 for the Salvation Army Victim Support Unit. The next God-Bites session will take place on Wednesday 28th March when we will be having a panel discussion on “Can war ever be justified?”. Our panel members will be Tim Atkinson, author and member of St Botolph choir; Don Jenkins, local historian and Mike Rose, port chaplain and associate priest.